I have been an amputee for 10 years. Living without a limb, even when a prosthesis is utilized, changes the natural stresses that occur within the body. The fact that I was on crutches for the five years preceding my amputation have only compounded those issues. I am happily married, but I am not wearing my wedding bands. Although this may seem strange to some, my husband has never questioned me. My placing the cherished rings into my jewelry box was a decision made out of necessity, not choice. Relying upon crutches for five years has wreaked havoc on my hands. During the Spring and Summer months I can proudly don my rings. As soon as the weather begins to chill, my fingers begin to swell. The nagging arthritis sets in, and I have to remove the jewelry because it becomes too painful to wear. My fingers become so cold that I am often relegated to wearing gloves inside the house. I have become skilled at chopping, dicing and cooking while wearing gloves! Even when covered with polar fleece, my hands remain uncomfortably chilly. Thankfully I have discovered a stopgap treatment for my cold hands. Dipping them into my paraffin wax spa, I immediately feel the tingling relief that comes from them warming up. If I could bottle this sensation I would surely be a millionaire! 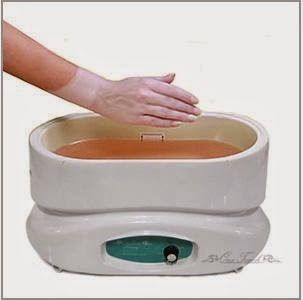 I wish I had a more permanent solution to treat my cold hands, but the paraffin spa works wonders for me. I appreciate that I don’t have to ingest anything in order to feel relief. I realize that the effects are only temporary, but finding short term relief has been a godsend.